Good Friday observance in Barangay (barrio) San Pedro Cutud, in San Fernando, Pampanga, Philippines. During this annual tradition of faith of Kapampangan Catholic Devotees people remember the suffering and crucifixion of Jesus Christ. Although the modern Catholic church now discourages this act of hurting themselves, many penitents called "magdarame" carry wooden crosses, crawl on rough pavement, and slash their backs before whipping themselves to draw blood. This is done to ask for forgiveness of sins, to fulfill vows (panata), or to express gratitude for favors granted. The event also includes a reenactment of Christ's crucifixion. 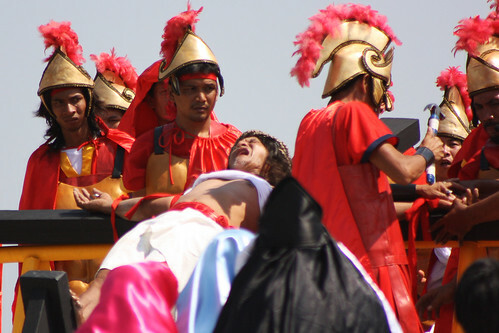 This part of the day featured 55-year-old Ruben “Mang Ben Kristo” Enaje, playing the role of Jesus Christ. This year is Mang Ben’s 25th year of crucifixion and according to him, this might be his last year and he is looking for the right person who will replace him despite the numbers of the potential candidates are many because he believe that the person must possess good characteristics and sincerity. In this picture, "Jesus Christ" has his hands nailed to the cross by a "Roman guard".